INFOGRAPHIC for Bitcoin Cash (ABC vs SV). 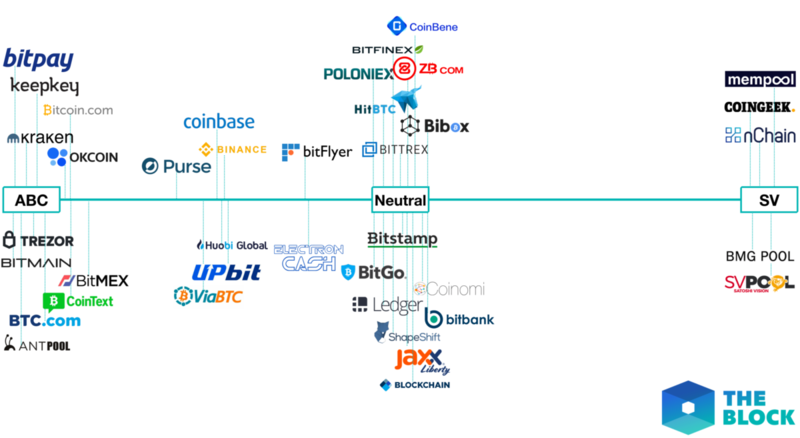 Where the large crypto companies stand (Coinbase, Binance, Bitpay, etc). If Coinbase, Binance, Bitpay, Bitcoin.com all announce that ABC remains as Bitcoin Cash BCH, and BSV is a new separate coin, the rest of the industry will just go along with it, to avoid naming & transaction confusion. Terrorism & vandalism from CSW / nChain / Coingeek wouldn't reverse that. Example: If a hacker group DDoS'd Microsoft every month and caused some damage, there's no way Microsoft would change the name of one of their products (Office, Excel, Xbox, etc) to the hacker group's name. No reputable business would officially rename a product to support terrorists & vandals. CSW / nChain / Coingeek will just be blacklisted from the industry. People will be allowed to sell their BSV tokens, then they will be delisted. So it's true that well-funded terrorists & vandals can 51% attack a coin, stop transactions, steal funds, etc. That has always been known. But if anything, any entity that behaves that way will be excluded from the business world. UPDATE 14-Nov-2018: Bitstamp will support ABC only. May consider adding SV later as a new coin. So Bitstamp moves to the far left on the infographic. Thank you for this. I urge the community to fund devs to implement new rules that allow us to be "malicious hash resistant". New rules that allow miners to orphan empty blocks, poison blocks, reorgs, etc regardless of the attackers hash rate. We have great assets in BCH ecosystem like Jonald, Chris, ABC team, bitprim. Rather than burning cash at calvin in a war of attrition we have to admit Bitcoin and its Game theory is broken and we need to implement new rules for honest miners to orphan attackers. Thank you @normal_rc in fighting and standing up for free will and human choice.